Three-Ring Binders meet needs of high-end presentations. Made to order, Turned Edge Binders accommodate those who want to feature detailed images and artwork in their presentation. Full-color graphics are litho printed onto paper wrap board and laminated for durability as well as aesthetic optimization. Suited for high-end presentations, ruggedized products come in various sizes with curved or flat spines and round- or D-ring styles. 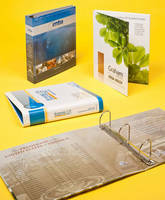 Case bound, 3-ring binders can accommodate sheets from 6 Â¾ x 3 Â¾ in. to 15 x 11 Â¼ in. Custom film laminated litho wrapped binders featuring full-color printing and graphics for creating distinctive and lasting presentations are being introduced by Advanced Looseleaf Technologies of Dighton, Massachusetts. Advanced Looseleaf Turned Edge Binders feature full-color graphics litho printed onto paper wrap board and laminated to create high-end presentation binders that are rugged. Available in a wide range of sizes with curved or flat spines and round- or D-ring styles, these case bound three ring binders combine fine quality aesthetics and optimum durability, claims the firm. Designed for those who want to feature detailed images and artwork in their presentation, Advanced Looseleaf Turned Edge Binders are made to order to accommodate sheets from 6-3/4" x 3-3/4" to 15" x 11-1/4". Supplied in 50 min. quantities, they are ideally suited for construction, real estate, legal, corporate, government, travel, and museum-quality presentations. Advanced Looseleaf Turned Edge Binders are priced according to design and quantity; made in the USA with 2-4 week typical delivery. Distributor, dealer, and commercial printer inquiries are invited.